Ascendo DataVault stores confidential information like Credit Card numbers, usernames, passwords, PINs, etc. using AES, the most powerful encryption available. DataVault is the most comprehensive Password Manager for PC Desktops, iPhones and BlackBerries. 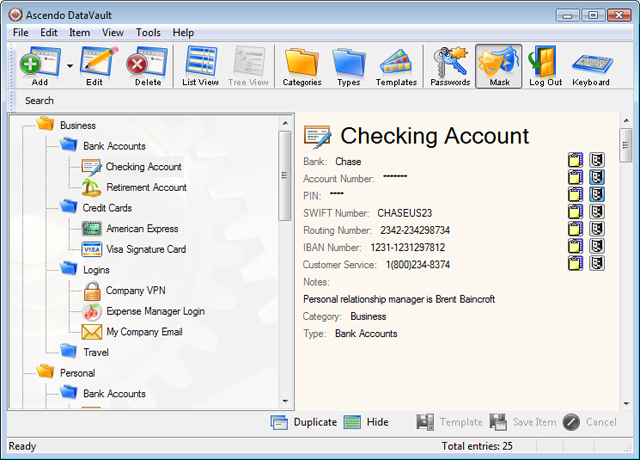 The rich feature set includes Synchronization, advanced Security Options, Tree and List Views, extensive Browser Integration, Email Encryption and numerous Customization settings. Unmatched features and ease-of-use have made DataVault the best-selling Password Manager for PC Desktop and mobile devices. Display Items in Tree View by Category and Type. Drag & Drop Items or Types to different positions in the Tree. Set default options for displaying Tree levels in Expanded, Collapsed or Last position. Hide Item details to maximize the number of fields displayed in List View. Display Item details in View or Edit mode. Advanced Browser Integration with Internet Explorer, Firefox and Chrome. Fill web forms automatically. For example, if you click on a Gmail Item in DataVault, your browser will open, go to the Gmail login page and auto-fill the Username and Password. 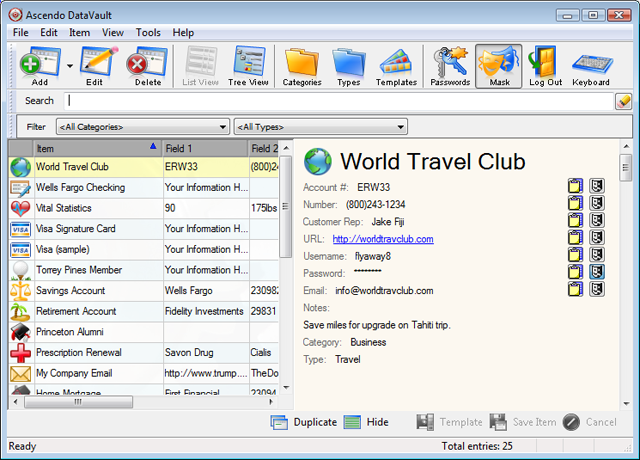 Use DataVault Toolbar in browser to auto-fill forms, save forms to DataVault Items and generate passwords. Fight phishing scams that try to get you to log into phony sites. DataVault will only enter usernames and passwords for URLs in the database. Mask individual fields or copy to Windows clipboard. Mask/Unmask all fields with one click. Synchronize information between BlackBerry and Windows PC. Resolve conflicts in case your entries don’t match. Import data from CSV files and from several 3rd party products like Cryptmagic, MiniSafe, SplashID, Illium EWallet, CodeWallet Pro, FlexWallet, Handy Safe, Spb Wallet, IE, Firefox, Roboform and several others. Export to a password protected, encrypted DataVault Exchange (*.dvx) files to share with other DataVault users. Export to a CSV file. Vista compatible. High resolution buttons and icons. Generate Strong Passwords using options for Length, Uppercase, Lowercase, Numbers, Punctuation Marks & Spaces. Choose a Master Password Hint. Set optional password for unmasking fields. Set a Security Time Out to log out automatically after a user defined inactivity delay. Enter passwords with Screen Keyboard to fool key-loggers. Maintain Activity Log to verify that you are the only person using the application. Backup and Restore using AES and set automatic backup option. Download DataVault with Free Trial period now! Ascendo DataVault for Windows is available for the introductory price of $9.95. Click here to download DataVault with 30-day trial period.